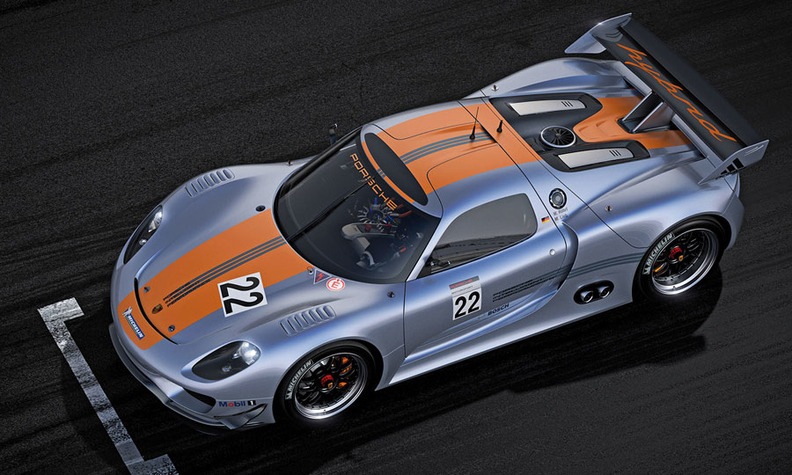 The Porsche 918 RSR is based on the 918 Spyder hybrid. Porsche marked its return to the Detroit auto show on Monday with the unveiling of a new motorsports-inspired concept of the 918 -- the company's two-seat supercar first revealed in road-going Spyder form at last year's Geneva auto show. Called the 918 RSR, this new advanced gasoline-electric-powered coupe closely previews a new series production-based race cars under development at Porsche Motorsport, which is eying a full-fledged factory-backed return to the famed Le Mans 24 hour race in 2012, according to new Porsche chairman, Mathias Mueller. The Le Mans link is enforced by Porsche's decision to provide its latest concept with the number 22 -- the race number used by Helmut Marko and Gijs van Lennep upon victory in the 24-hour classic in 1971 at an average speed of 138.3 mph, for a total distance of 3,315.9 miles -- a record that stood for 39 years until Audi's victory in 2010. In addition to pointing toward a future race car, the 918 RSR also provides clues to the appearance of a new coupe version of the 918 which is set to be produced alongside the open-top model at Porsche's Leipzig factory in Germany from 2013. Successor to the Carrera GT, the 918 is based around a lightweight carbon fiber monocoque and uses a mid-engined mechanical layout enhanced by the addition of two electric motors mounted within the front axle assembly. Differing from the open-top 918 Spyder which uses conventional front hinged doors, the closed roof 918 RSR adopts gullwing style doors that hinge overhead. The coupe configuration is aimed at improving overall aerodynamic efficiency. Inline with its motorsports ethos, the supercar also gains a series of downforce enhancing features, including small winglets up front, vents in the front bodywork to reduce pressure within the wheel arches at speed, a roof-mounted air duct and a large rear wing. Powering the 918 RSR is a high-tech gasoline-electric drive system that borrows engineering solutions from the Porsche 911 GT3 RS hybrid, as campaigned by the German car maker in various events during 2010, including the famed Nurburgring 24-hour race. Primary propulsion is provided by a mid-mounted 4.5-liter V8 gasoline engine that kicks out 565 hp at a searing 10,300 rpm and provides drive exclusively to the rear wheels. It is a development of the unit used by Porsche in the earlier 918 Spyder, but with an extra 800 rpm at the top end, it produces an added 65 hp in race trim. The gasoline engine is supported by a pair of brushless electric motors integrated into the front axle, where they develop a combined 204 hp and channel drive through a torque vectoring device to the front wheels -- in the process providing the new concept with four-wheel drive compatibility. Altogether, the 918 RSR packs a total of 767 hp, but only for short eight-second bursts of electric motor assisted propulsion. Departing from the earlier 918 Spyder, which uses a conventional full mode hybrid drive system complete with lithium-ion batteries and plug-in charging capability, the 918 RSR relies on an advanced kinetic energy recovery system (KERS) flywheel similar to that employed on the 911 GT3 RS Hybrid race car to create energy under braking and brief periods of overrun to power the electric motors. It was developed by engineers at the Porsche R&D center in Germany in partnership with Williams F1 Engineering in England, which originally designed the system for incorporation on its Formula One race car for recent FIA regulations permitting hybrid drive. The flywheel sits in the space usually reserved for the passenger seat and is capable of operating at up to 36,000 rpm. The driver can call up the added 204 hp provided by the electric motors at the press of a button.